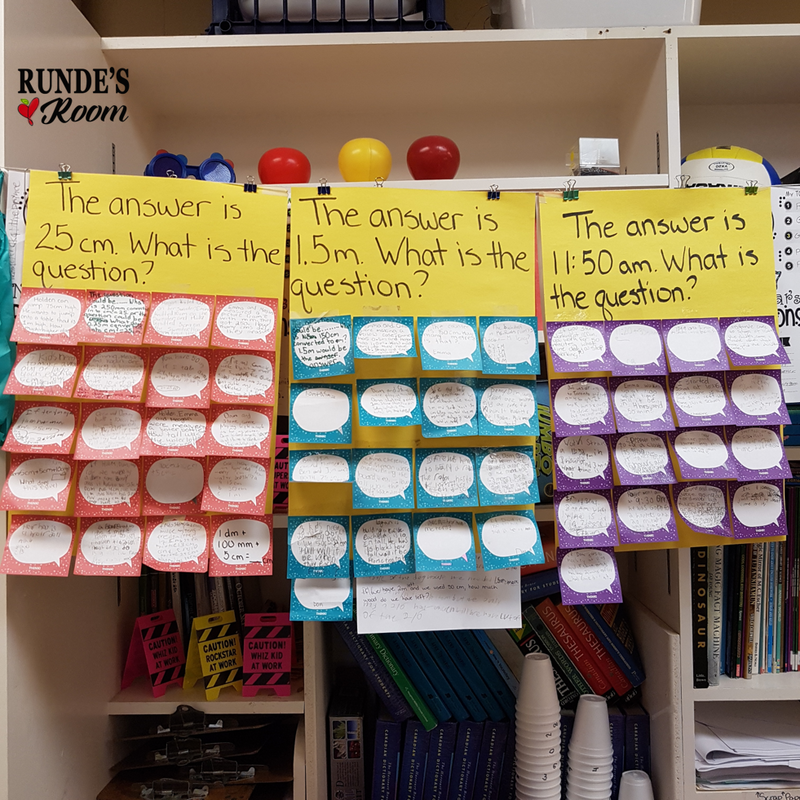 One of my favorite ways to use task cards in the classroom is to hide them around the classroom, so students have to hunt for the cards before they can complete each task. Cards are numbered, so students can complete the tasks in any order. 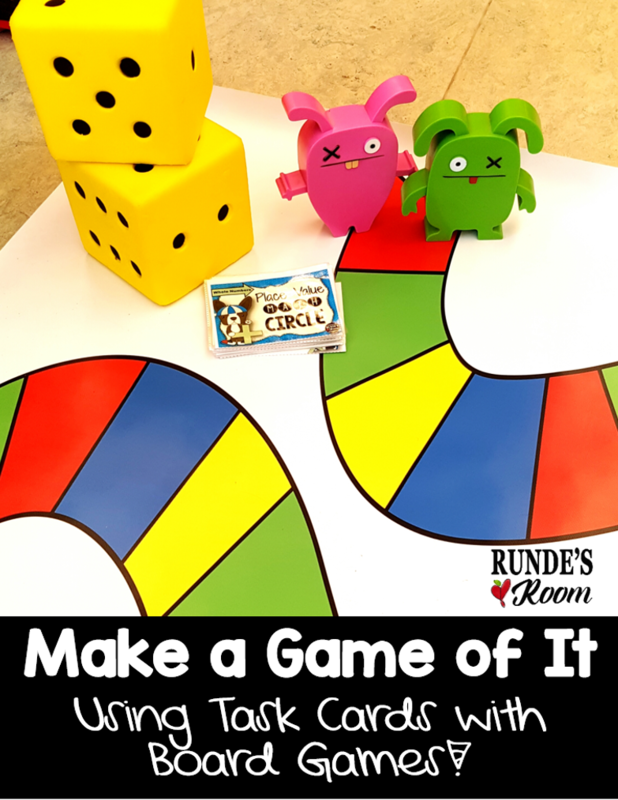 It's just a little way to get them out of their seats and moving around the room, and it's a super easy way to add a little more fun to the activity. It only takes a couple of minutes to do - I'll hide the cards in the morning or during a break - when the kids aren't in the room - in the bookshelf, behind cupboard doors, under a desk top, on the back of a chair ... anywhere except inside desks or books. This way of hiding task cards led to me creating these Math Scavenger Hunt Task Cards. One of our school goals is to continue to integrate more technology into our activities, so I made these cards as more of a "digital scavenger hunt" - students will collect pictures of the objects or numbers they need to find according to the task cards, rather than collect the actual object or number. 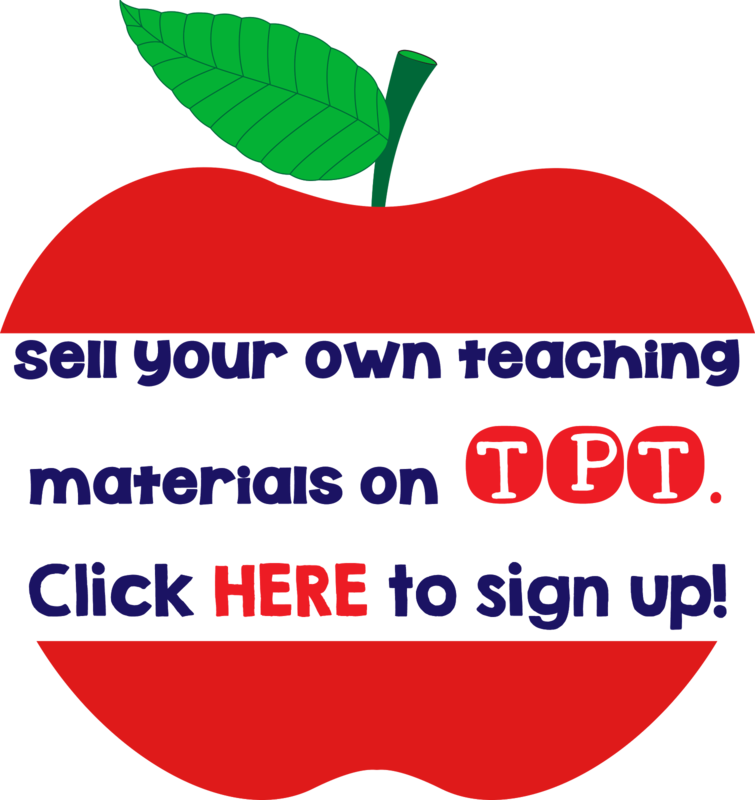 Students can take pictures of the objects on any device - depending on the number of devices you have available, you could have students complete this activity individually, in pairs, or in groups. I only have 5 iPads in my room, so we'll definitely be working in groups. You can have students work only in your classroom to complete the tasks (or find the objects), or they can work in a larger area of the school if you have access to one. 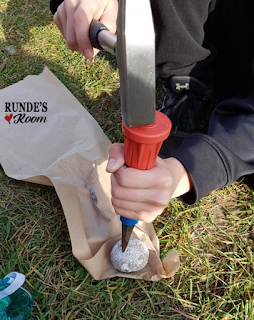 Students should hunt through books, magazines, classroom walls and resources, newspapers, anywhere and everywhere, while trying to find the different objects. 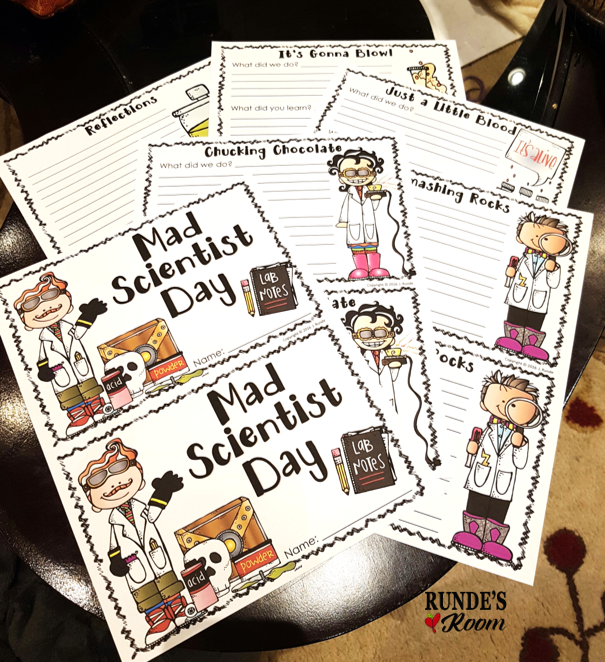 Students could use the pictures they collect as evidence they have completed the tasks. They could also display their picture galleries to other groups during a "gallery walk" activity. 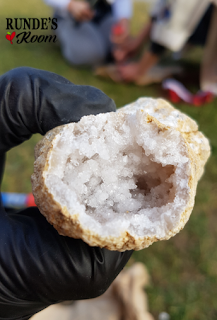 You could also take it a step further and have students create a quick slideshow of their scavenger finds. There are many possibilities. 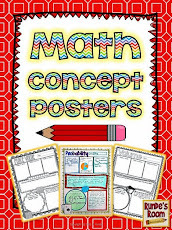 Pictures could also be printed and added to students journal responses as a reflective bulletin board. 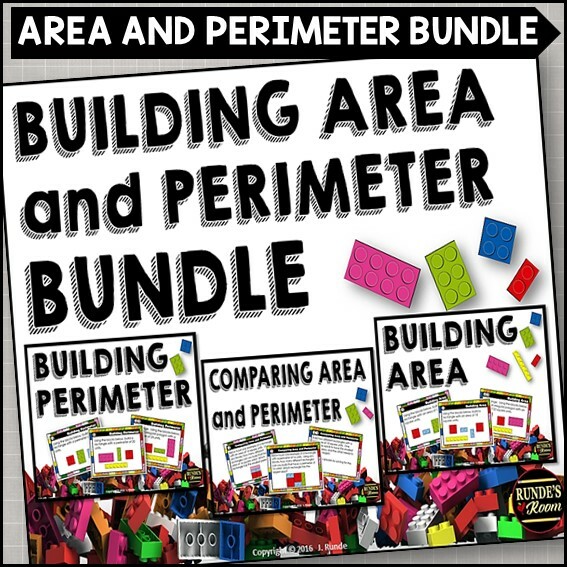 This Scavenger Hunt Task Card Bundle contains 4 different scavenger hunt resources - Place Value, Math in Real Life (a good overall review of math terms), Classroom Geometry, and Classroom Measurement (two versions of this resource are included - one with metric units and one with customary). 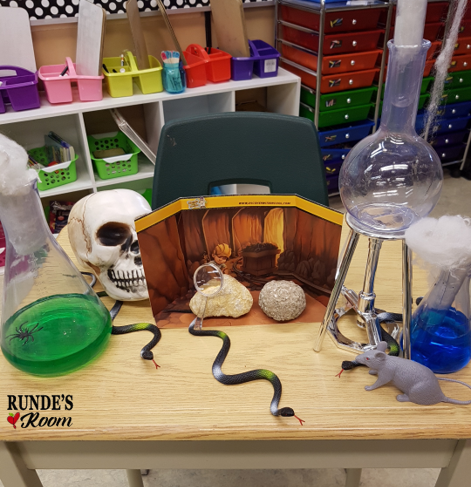 Each resource makes a great diagnostic activity at the beginning of the unit, or a review before a summative task. 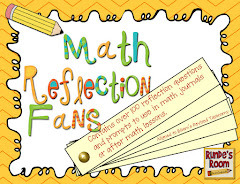 They are also an easy low-prep activity, perfect for your sub tub, or math station resources. 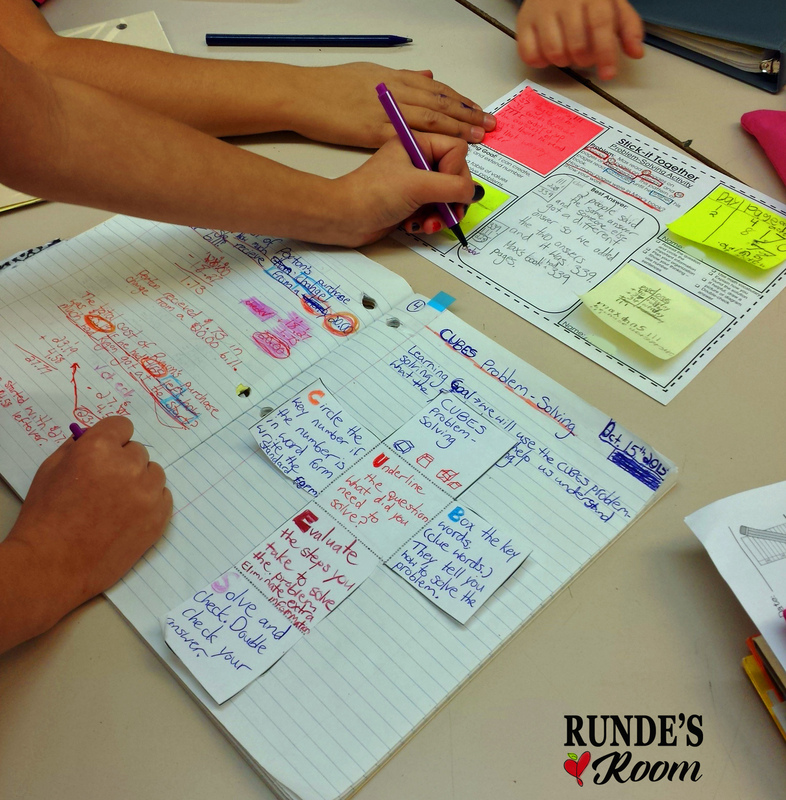 Each resource contains a Minds-On Task I like to use whole group to introduce the activity, 12 task cards, a journal prompt (this is optional - it could also be a good discussion question or activity at the end of the task), and a student answer page. 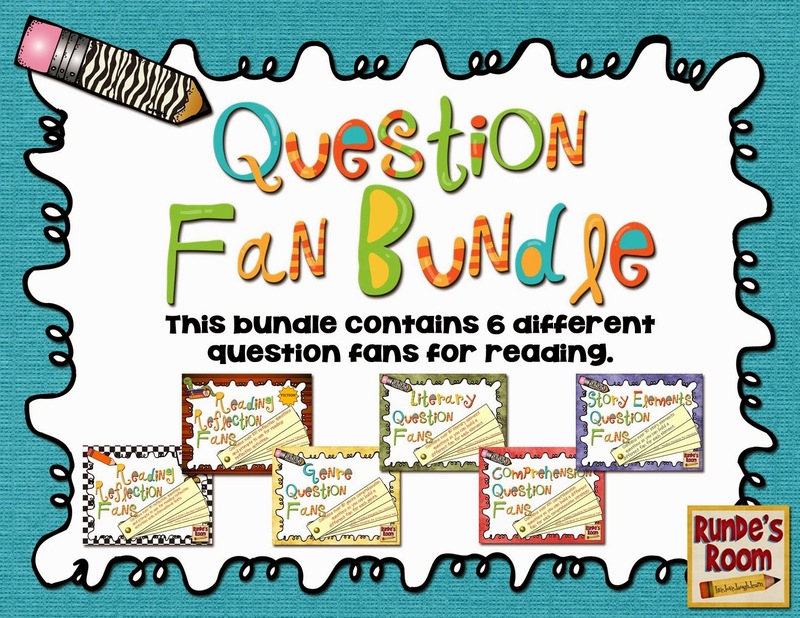 You can take a peek at my Math Scavenger Hunt Bundle by clicking HERE or on any of the images in this post. 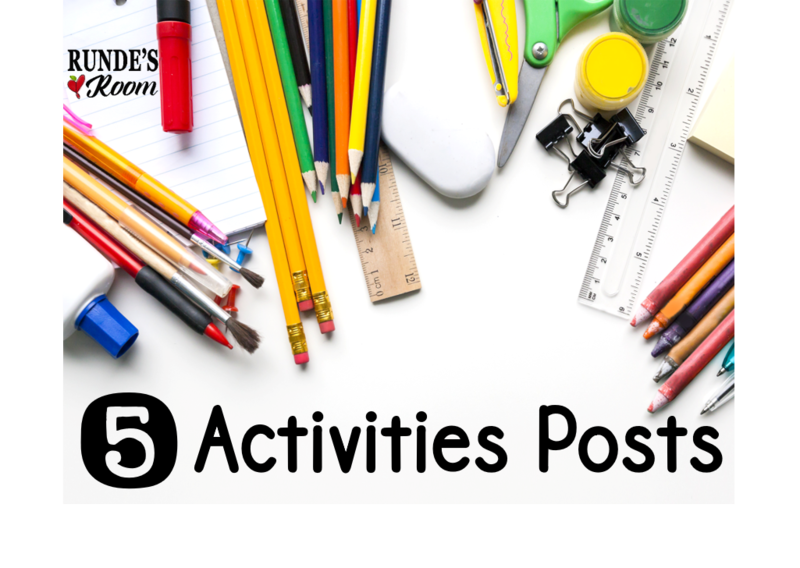 This "5 Activities for Teaching" post (click the link for more 5 Activity Ideas) is all about Problem-Solving in Math. 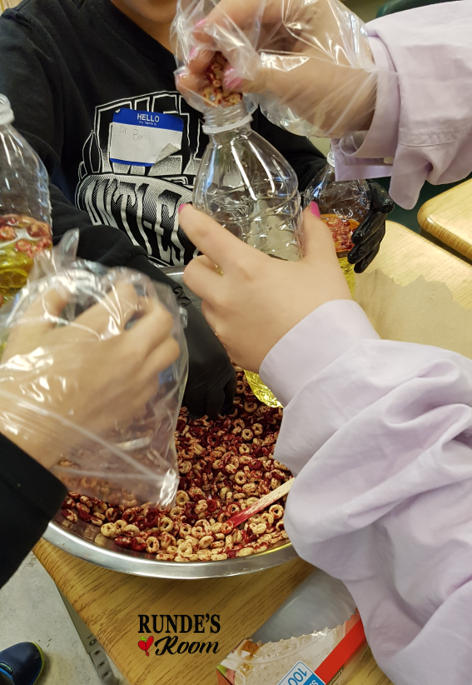 As our testing relies heavily on our students' ability to problem-solve and analyze and solve word problems, we have a heavy focus on problem-solving all year long. 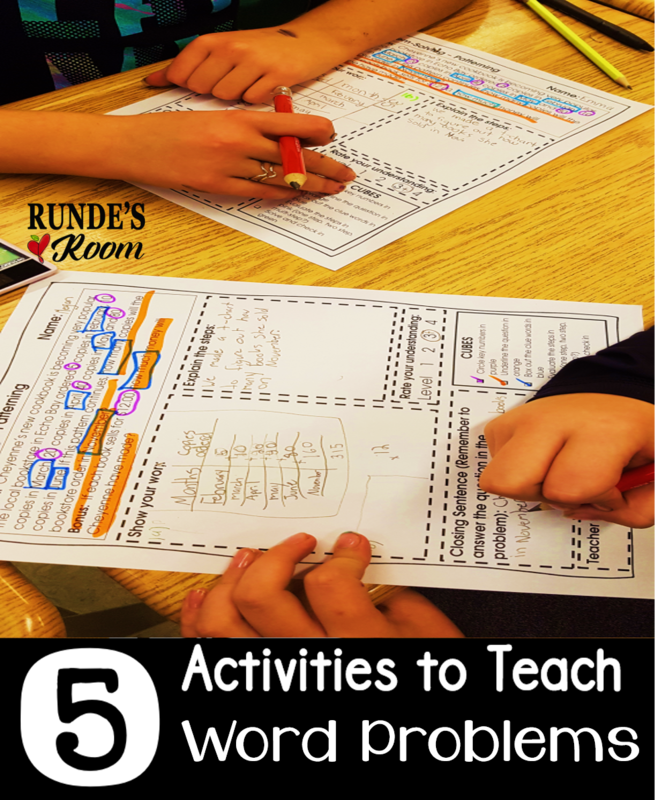 This post aims to give you some new ideas to get your students digging deep into word problems, on their way to becoming problem-solving masters. Before I began using CUBES with problem-solving, I would watch in frustration as my students plucked numbers from the question and began solving without really thinking about WHAT they needed to solve. Sometimes they would miss some of the steps in a multi-step question, and other times their answers weren't actually answering what the question asked. 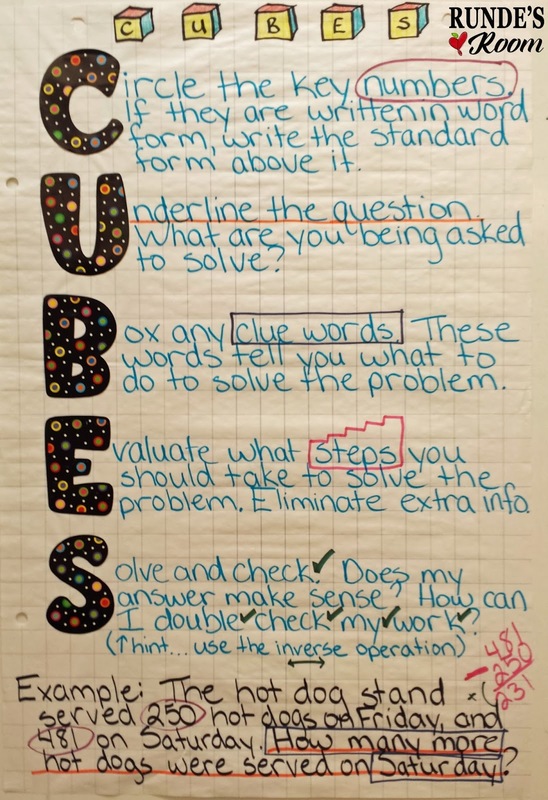 By introducing CUBES, my students now actually slow down and examine the question fully first ... leading to much greater success in problem-solving activities. 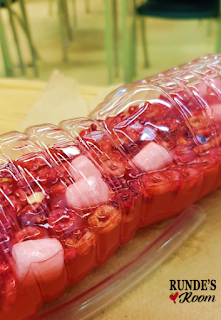 I introduce CUBES very early in the school year. 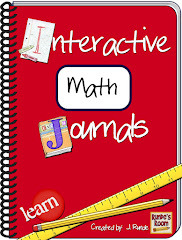 I hang an anchor chart in the classroom, and we complete an entry in our Interactive Math Journals (click HERE to see this resource in greater detail). 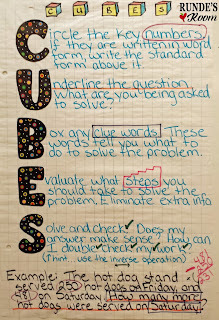 I also created sets of concept-related Word Problem Activities using CUBES. 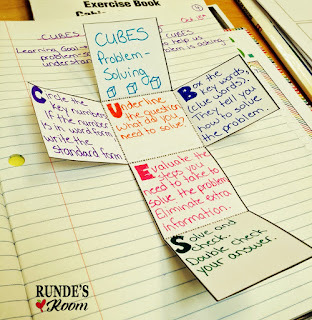 These resources contain a checklist for CUBES right on the page that students need to complete before they begin solving the problem. 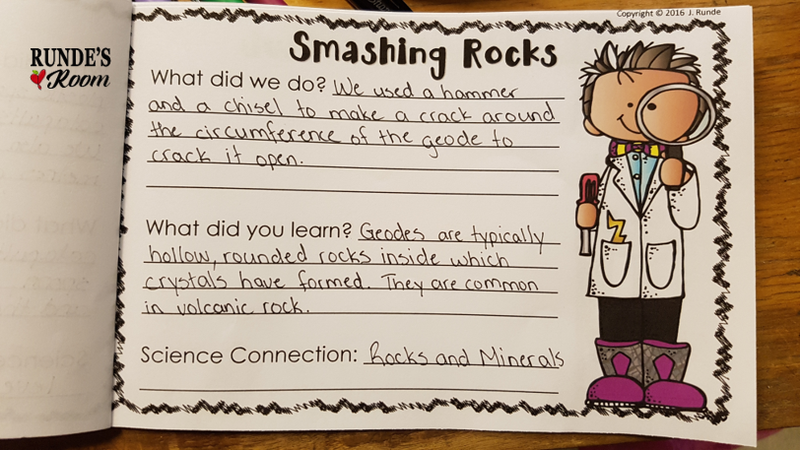 I LOVE using these pages for quick formative assessments in the classroom - and they make a great portfolio piece to keep parents informed of what we are doing in the classroom, and how their child is progressing. There are 2 different versions of each word problem so you can easily provide differentiation for your students or provide some extra practice for students who need some reinforcement with the concepts. Once my students know how to analyze the word problem, it's time to start talking about how to SOLVE the problem. 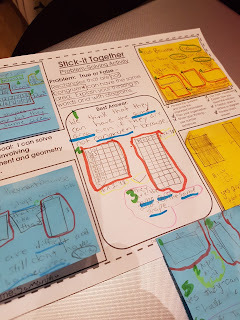 Because we have a HUGE focus on communicating HOW the students solve the problem, just showing their work isn't enough - they have to show their thinking, too. 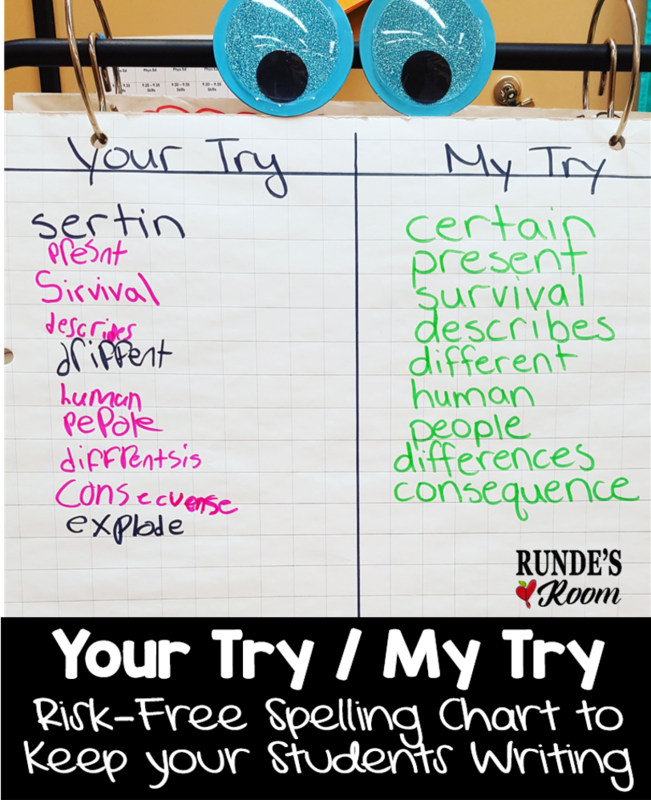 Using my Building Better Responses in Math has been the key to this in my classroom. 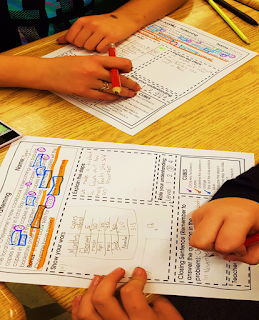 This resource breaks down the problem-solving process step-by-step and creates a set of easy-to-follow success criteria for students, ensuring that they have not only solved the problem, but also communicated their thinking during the process. 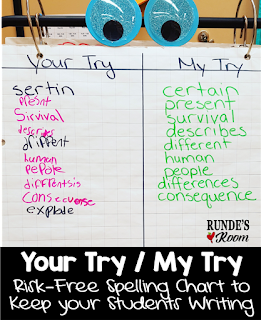 We start out with our first success criteria, and every time we master a criteria (usually every two to three weeks), we add another criteria to our board (there are 9 criteria in all). 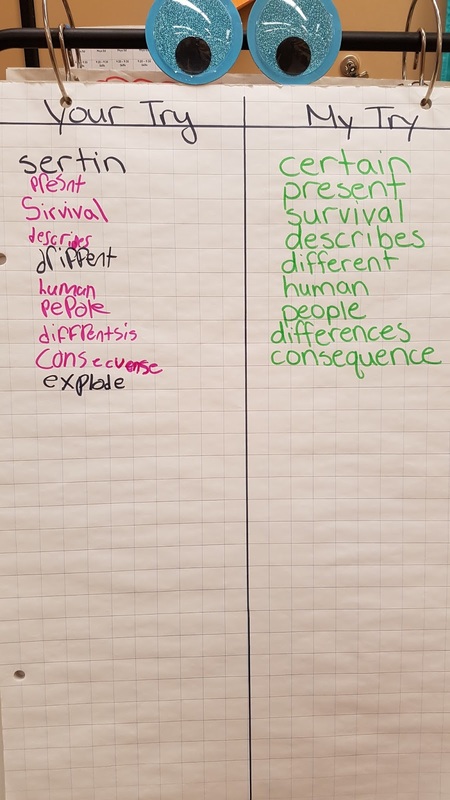 I also post EVIDENCE (a student-created exemplar) alongside the criteria each time we add a new one. This gives the students a model to reference. 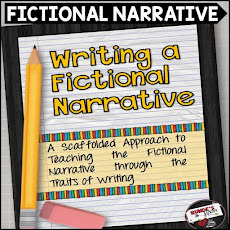 This resource also comes with printables for students to practice each criteria in isolation, as well as pages for scaffolding the steps each time they add a new one. 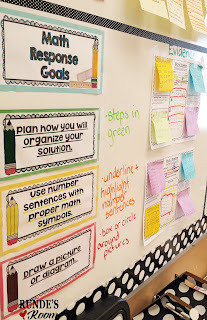 All pages contain a checklist for students so they can be sure they are completing each step. 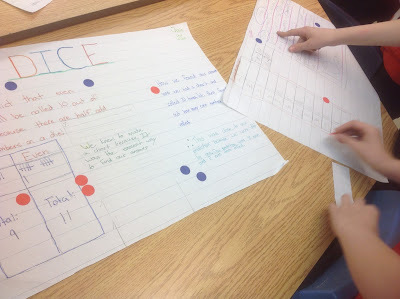 I LOVE this open-ended activity for getting students to think about word problems. I start with an answer, and get each student to write a word problem for the answer on a sticky note. They quickly check in with me before they post their question. 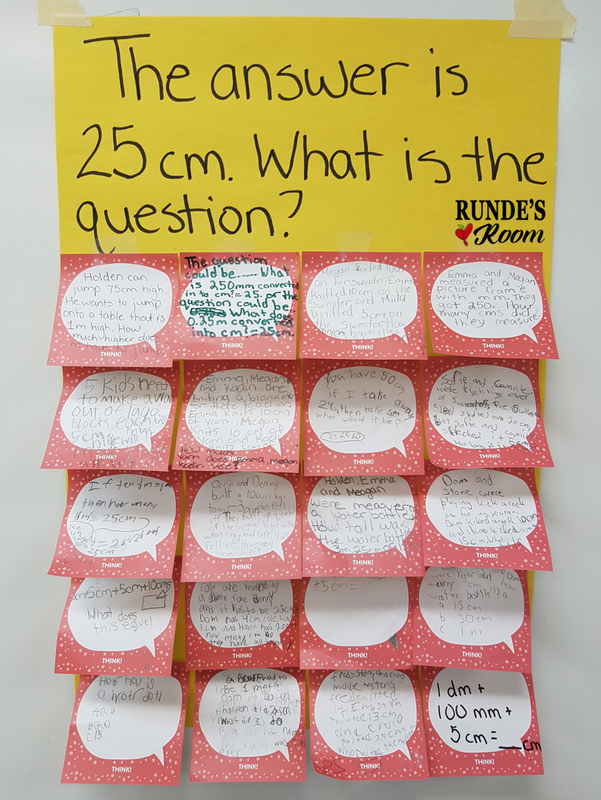 When we first started this activity, students were including the answer IN their question, but with more practice, they are now thinking more about writing the word problem with the answer in mind. To extend this activity, students can choose a word problem written by a peer, and work to solve it - PROVING the answer is correct. Students can be a GREAT reference for each other. I love letting my students explore word problems together. They often have different ideas and strategies for how to solve a problem, which leads to awesome conversations about justifying their answers. 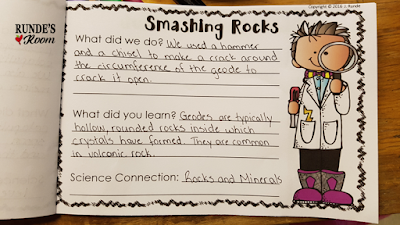 I always make them responsible for completing their own pages, but they can work together on the solutions. 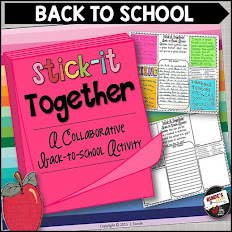 My favorite resource for this is my Stick-It-Together Math Resources. 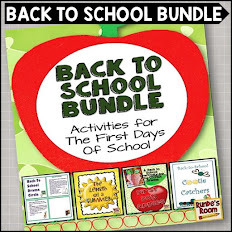 These resources have students working together in groups of 4. Each students is responsible for solving the problem independently first (on a sticky note), then working together with the success criteria to build the best response they can from each other's responses. 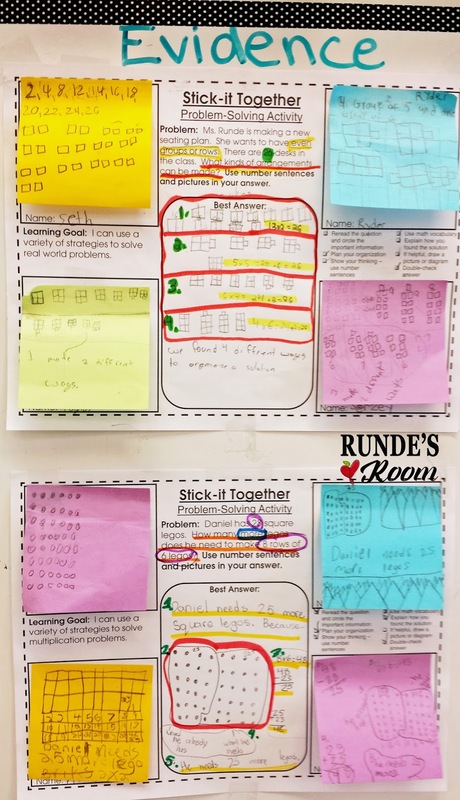 I hear the BEST math talk when using this resource, and I watch them go back into their notes to help them with their solutions, which makes my teacher heart smile. 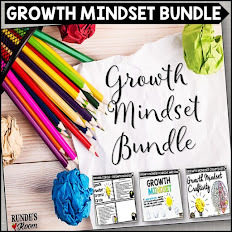 Each of these resources also contains an editable template, so you can add in any word problem you want to work on - better yet, give your students the opportunity to come up with the problem themselves. 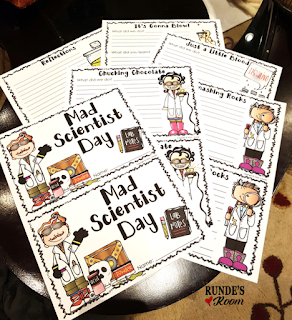 You can also have them work together on large chart paper, or just give them some clip boards for their paper and let them work anywhere they wish within the room. 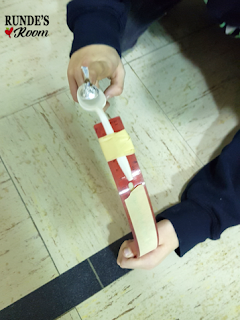 This is my students' favorite way to problem solve. 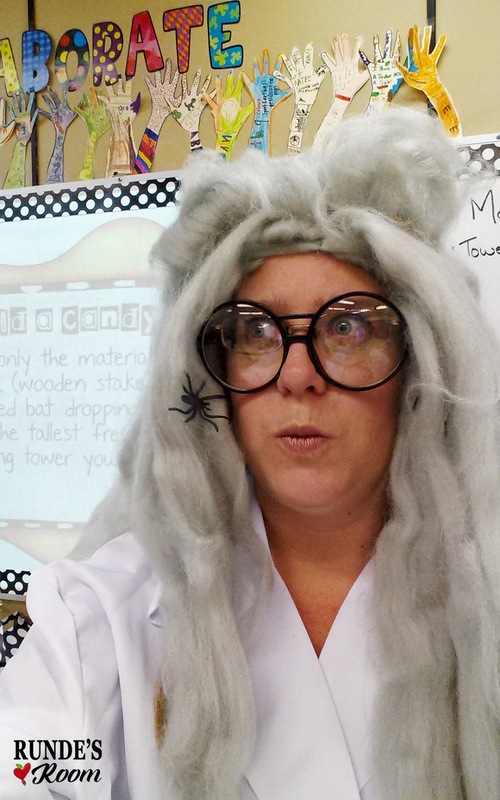 Lastly, let your students be the experts. Allow them plenty of time to see other solutions, and comment on the work (their own, and other's work). I do a lot of peer and self-evaluation with problem-solving. After problem solving activities, we do gallery walks - where students' work is displayed, and the students are asked to go around and view all the work, giving "stars and wishes" to their peers. This makes them really think about what is needed in the solution to fully answer the problem. 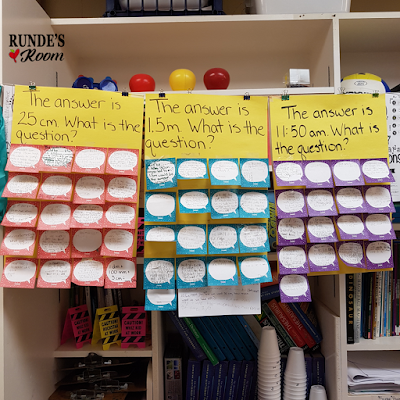 I also like to post all the responses on the board, and allow students time to present their solutions - explaining what they did and how they know they are correct, or what they would do differently next time. 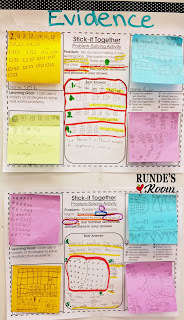 To help them differentiate between explaining HOW they solved the problem, and WHY they chose the steps they did, I also like to do an activity where I give the students two different colors of stickers or sticky notes. They walk around the gallery of math, examining all the solutions, and place the one color where they see students explaining HOW, and the other color for WHY. This really helps them see the difference between the two. I then allow them time to go back to their own solutions, to see if they have completed both steps, and improve upon their communication. These are just a few ideas. 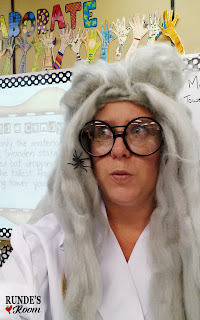 I'd love to hear some of your fabulous ideas for helping your students dig deeper into word problems - just leave a comment below to share your ideas. 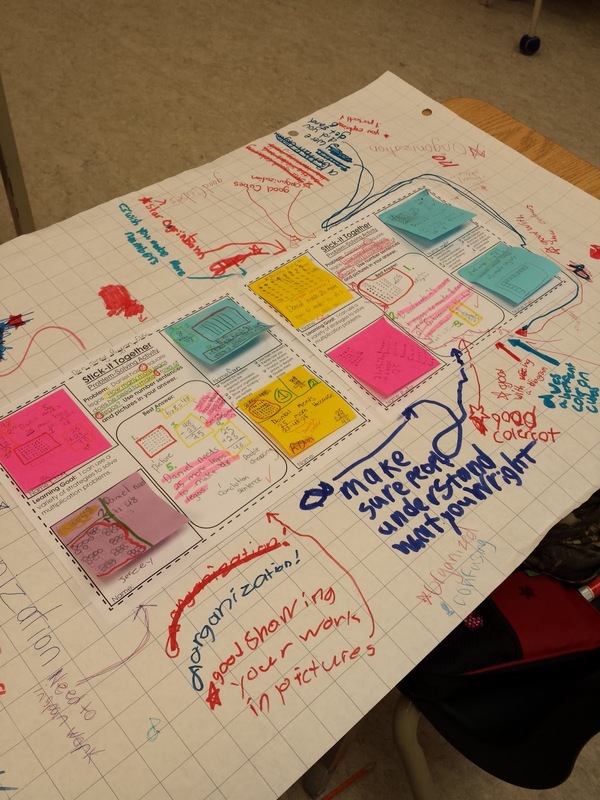 My students love task cards - especially ones that get them moving. 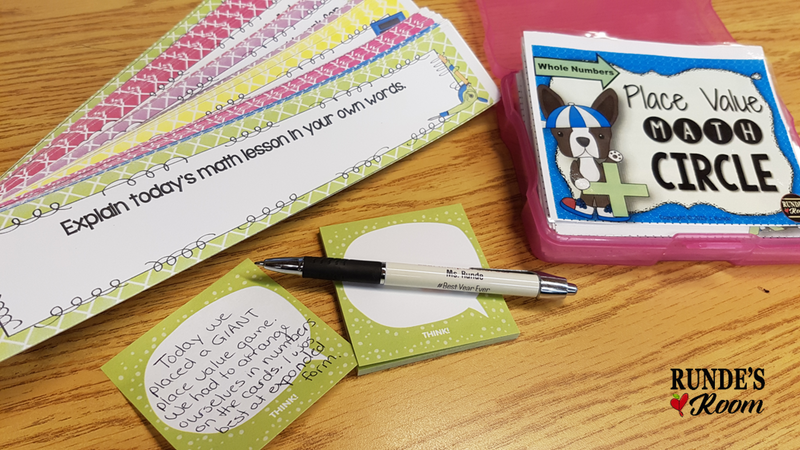 That's exactly why I created my Math Circles - sets of task cards that get my students up and moving while learning and mastering the concepts. 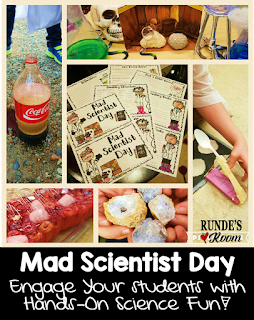 So engaging for all students and absolutely perfect for your kinesthetic learners. If you're anything like me, you have probably have tons of sets of task cards in your teacher stash already. One day last year, while I was figuring out ways to use my task cards in more engaging ways, I had an awesome thought. I wanted a GIANT game board so we could "play math" in a GIANT way. So, I made it my plan to accomplish this during the summer. 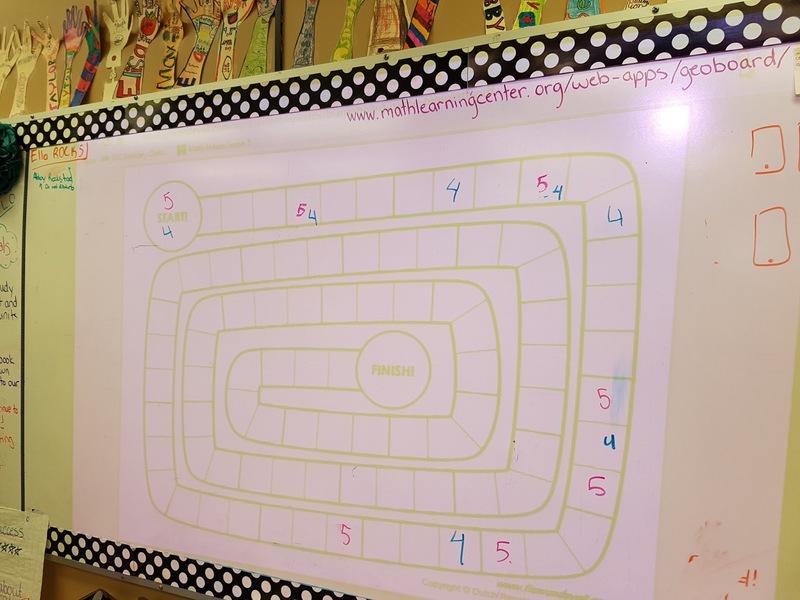 I'm so glad I did - our giant game board has been an amazing addition to our math classes, and whenever my students literally BEG me to "play math", I know I've got a winner. 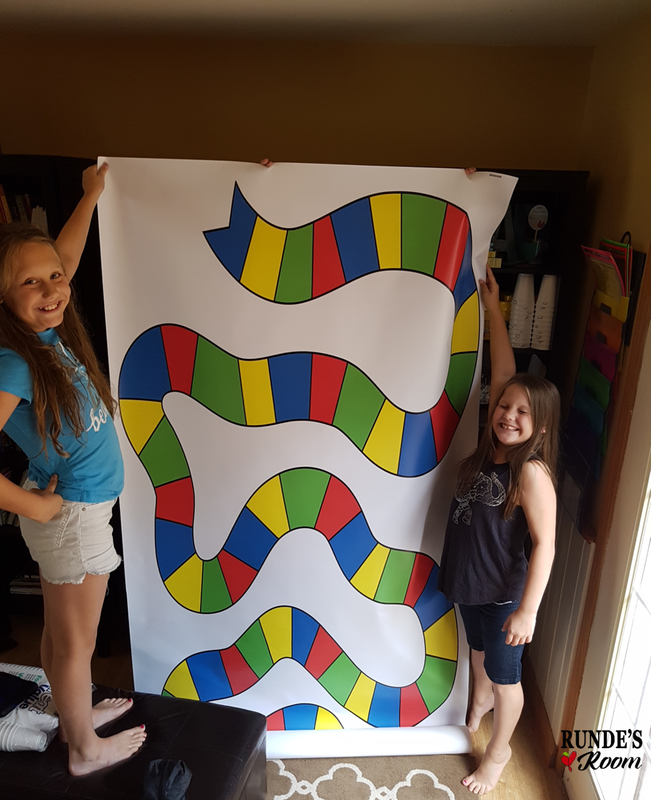 I ordered my game board through Vistaprint. It is a 4 x 8 vinyl banner. If you create an account with Vistaprint, they have some amazing sales and promo codes they will keep you informed about. I waited until they had a good sale going to buy the banner. 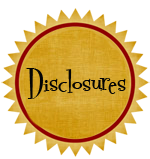 I bought some board game clip art from Zip-a-Dee-Doo-Dah Designs and resized the game board a bit in photoshop (powerpoint would work, too) so it would fit. I resized it to 24 x 48 inches and when I uploaded it in Vistaprint, the image worked perfectly - it's nice and crisp and fills the banner perfectly. Now, go big or go home doesn't apply here. You don't have to make a giant banner - anything would work. 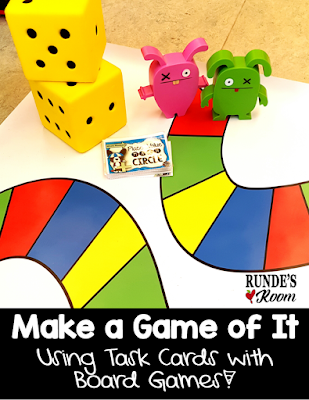 You could draw a game board on bulletin board paper (it would make an awesome permanent bulletin board if you pinned the game pieces on it - a bulletin board you don't have to worry about changing ALL year long). 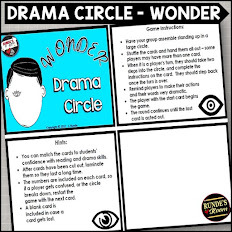 You could also use a large piece of cardboard - get your students involved in drawing the actual game board! 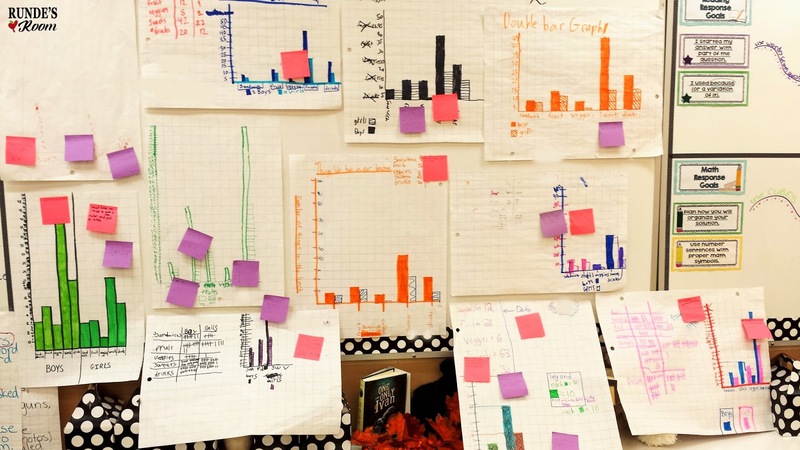 You could also do this on a smaller scale on regular paper so you could use it as a math station. Anything goes! Last year when I thought of this idea, I tried it out by projecting an image of a game board on my whiteboard (there are tons of free blank game boards available when you search on google images). We just used whiteboard markers to track our progress around the board. Quick and easy and best of all - no prep. To go along with our GIANT game board, I decided we just had to have some GIANT dice, so I found some on Amazon (I have included my affiliate link below this post). 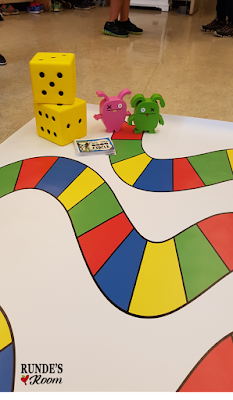 You can use almost anything for the game pieces - I have a fun little collection of "ugly dolls" (they are just too cute to be ugly) in my classroom that work perfectly. 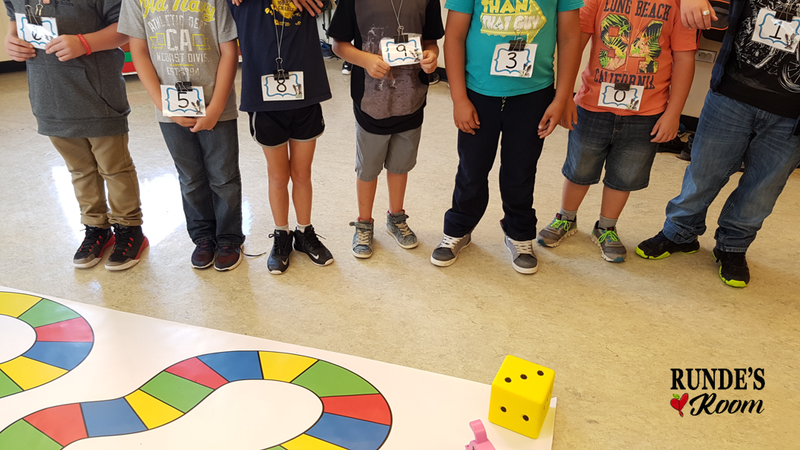 I used my Place Value Math Circle to break in our new game board (but could use any set of task cards - and this doesn't just have to be limited to math). We rolled out our board game in a nice open area and I divided the class into two teams. 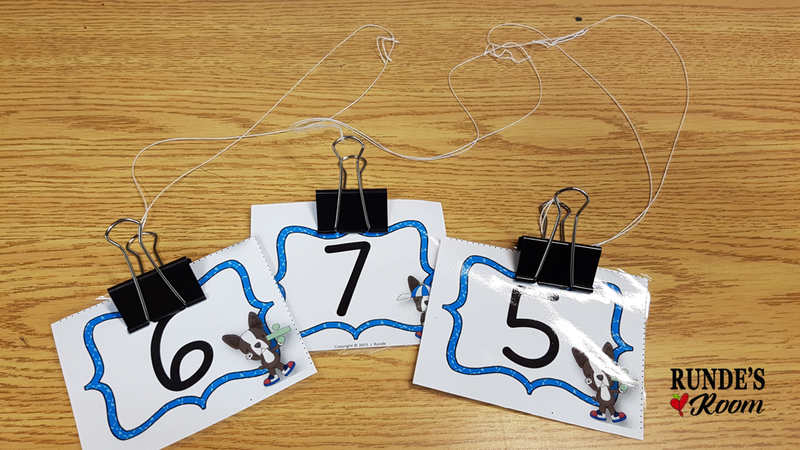 I had previously printed out the numbers for the game (the same set of numbers can be used with many of my math circles) and have made them into necklaces with string and a clip. These hang on a hook in my classroom and we use them often. I handed the first team the first card from the math circle. They had to read the instructions and arrange themselves into the number on the card (numbers are written in different ways on different cards - in word form, expanded form, by place value column, and greater than and less than form). When they were finished, the opposite team examined the card and determined whether the number the first team made was correct or incorrect. 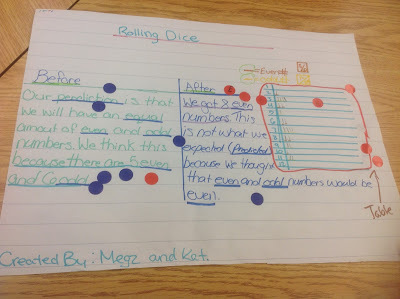 If correct, the first team got to roll the dice and move the number of spots indicated. 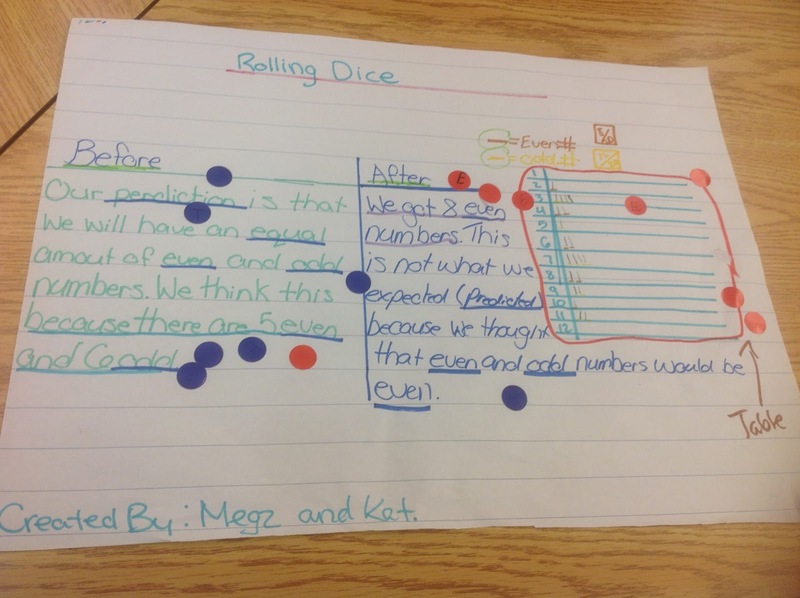 If they were incorrect, they did not get to roll the dice or move. 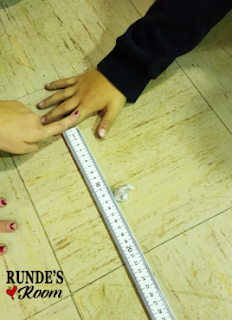 Then, the second team got the next card in the math circle - and followed the same procedure. Repeat. If you are using 2 dice, the game goes quite quickly - if you want to make the game last longer, only roll one. In the picture above, students were asked to build a number that was 1000 greater than 6,588,301. I also have sets that fit both the US and Canadian way of writing the numbers (either with commas as place value holders, or spaces). And that's it. SO much fun. 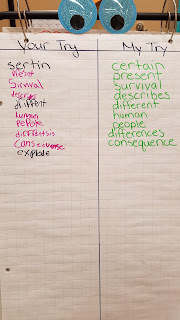 When we were finished, we came back to the classroom to reflect on our activity. 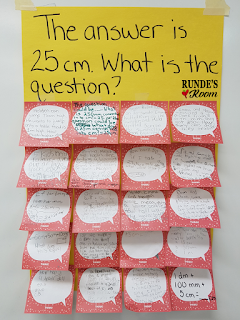 I posted a question from my Math Reflection Fans and asked them to answer the question on a sticky note which we then posted. You could also just have them write their answers on a large piece of chart paper (whole group graffiti style) or on the whiteboard. 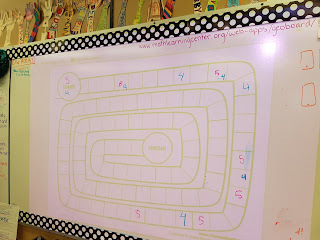 My students are already asking when we're using the game board again ... and I have to admit, I can't wait!!! I've got a Rounding Math Circle that will be perfect for the end of the week!